DreamWorks Animation invites you to meet a most unusual baby when "THE BOSS BABY," the “wildly funny” adventure comedy of the year arrives on Digital HD July 4 and on Blu-ray and DVD on July 25. Seven-year-old Tim Templeton suddenly finds his share of parental love plummeting when his new baby brother (Alec Baldwin) arrives — wearing a suit and toting a briefcase — and makes it clear to everyone that he’s in charge. But when Tim discovers that Boss Baby is on a secret mission, he reluctantly agrees to team up with his pint-sized sibling for an epic adventure that might just change the world. From the director of the hugely successful Madagascar franchise, Tom McGrath, comes a hilarious adventure-comedy about family and belonging. In addition to Alec Baldwin, "THE BOSS BABY" features the voice talents of a stellar cast including Steve Buscemi, Jimmy Kimmel, Lisa Kudrow, Miles Bakshi and Tobey Maguire. 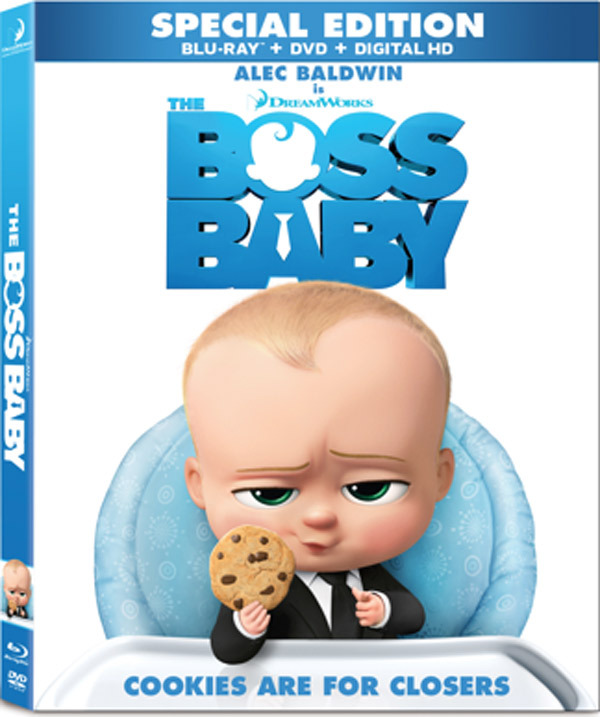 "THE BOSS BABY" SPECIAL EDITION comes loaded with bonus features including the NEW Mini Adventure, a 3-minute action-packed journey through time featuring Boss Baby and Tim. Additional bonus materials include featurettes like “Cookies are for Closers: Inside BabyCorp,” Deleted Scenes and more. NEW Mini Adventure: The Boss Baby and Tim’s Treasure Hunt Through Time ­– Narrated by Wizzie, the magical wizard, join Boss Baby and Tim on their adventure! The Forever Puppy Infomercial – Always playful, always snuggly, and everlastingly cute; The Forever Puppy is destined to win the cuteness competition with babies once and for all. BabyCorp and You – Helpful advice and more for new infants on the job at BabyCorp. Babies vs. Puppies: Who Do YOU Love? – Who has won the hearts of familes once and for all? This “scientific” experiment compares and contrasts factors such as “cuddliness,” “adorability,” and “attention grabbing techniques” used by both demanding competitors. The Boss Baby's Undercover Team – From Staci, the note taker who can’t read, to Jimbo the huge baby who’ll take a suction cup arrow for the Boss, to the triple-threat of the Triplets, Boss Baby dives deeper into this team of cute corporate board members. The Great Sibling Competition – A fun, kid-friendly and humorous look at the competition among siblings to win the affection of their parents. Explore conversations with the cast and crew on their competitive sibling relationships and get very special insights from Boss Baby himself: Alec Baldwin.